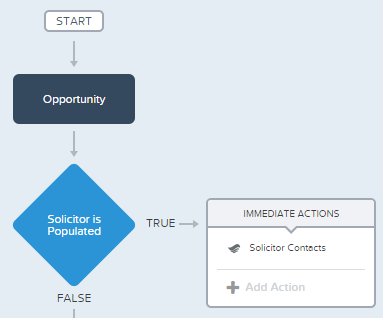 There are two common requests I often get related to Opportunity Contact Roles, both now solved easily with clicks instead of code thanks to Flow and Process Builder! Note: be careful with active Processes when doing bulk data uploads – it’s not bulk-ready and even these simple updates can cause you to hit limits. 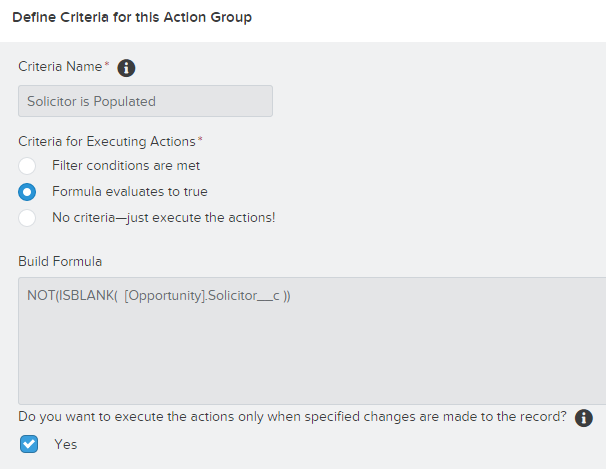 Update as of Winter ’16 release: Process Builder is now bulkified! In the nonprofit world, gifts often have Solicitors – other contacts who get soft credit (Opportunity Contact Role) records on gifts (Opportunities) from other donors. 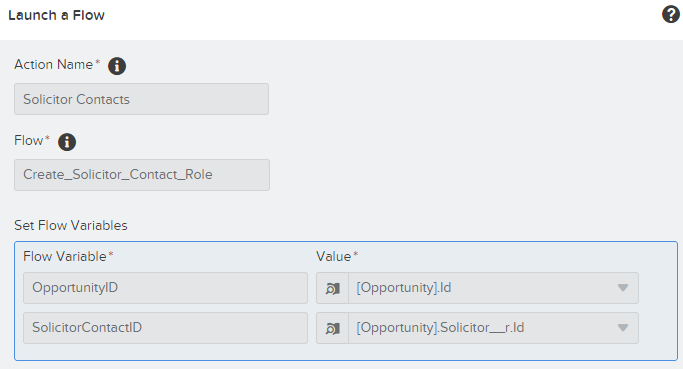 It is much easier, with less clicks, to populate a lookup field directly on the Opportunity than it is to create the Opportunity and then add the Contact Role afterwards. 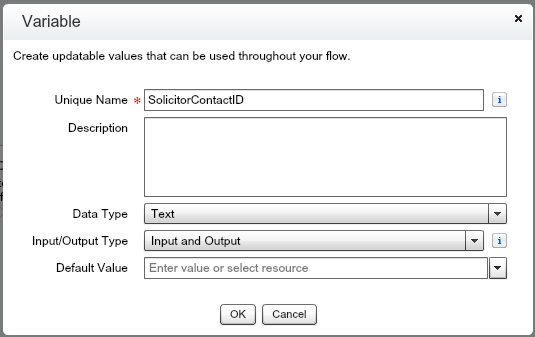 With your new Flow and Process, when you save the record an Opportunity Contact Role is automatically created for the Solicitor! If you’ve never touched Visual Workflow, get an overview of how it works here. This Flow is simply two variables you create and then one element. I set them both for Input and Output, but Input Only is fine too. Now you just need to create a single Record Create element to make the Contact Role record. 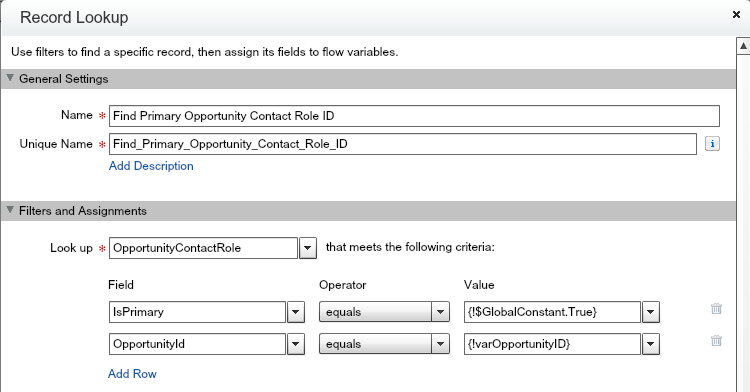 You’re just populating the Contact ID and Opportunity ID needed in the Contact Role record with the variables you created. Save and Activate your flow (don’t forget to mark the element as the starting point!) 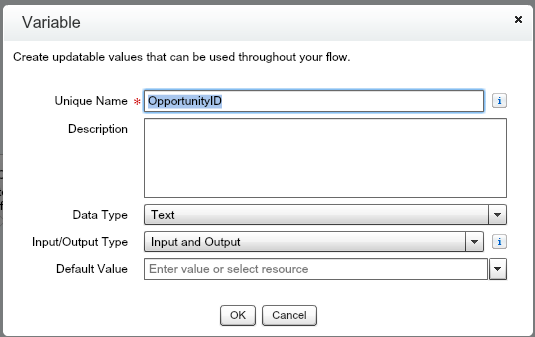 and now you can make the Process that will send the IDs to the Flow and make it happen. If you need to learn more about Lightning Process Builder, start here. I sometimes use formulas for criteria, sometimes I’ll use the drop downs. 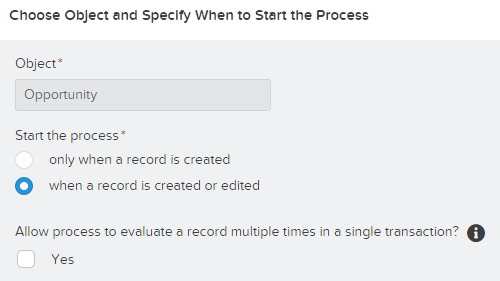 If I get an error message that a record didn’t create because it failed to activate a Flow, often switching to a formula solves the problem. That is what happened in this case, but as you see in the other example below the criteria is using the filter conditions and it seems to be working just fine. Go with what works. 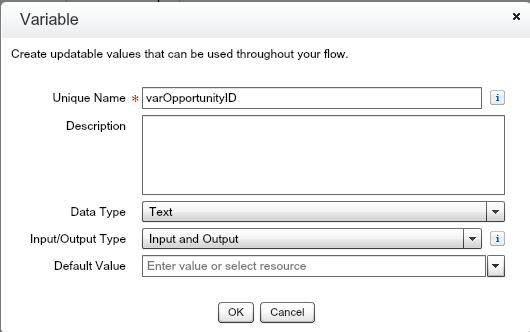 Now your action is to launch the Flow you just created, and you can pass through the necessary IDs to the variables! Activate the Process and you’re good to go. This is a common request from nonprofits. An admin wants to create a workflow rule email and send it to the contact who made the donation… except there’s no easy way to pull the contact from the Opportunity Contact Role record. If only that Contact was a Lookup field on the Opportunity, it would be easy. But it’s a pain to keep that data updated for every Opportunity. Too many extra clicks. 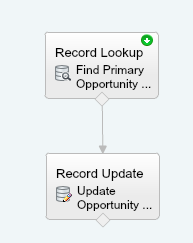 … automatically populate a lookup field on the Opportunity without having the user worry about it. Once again, you start with the Flow since you’ll need it done and activated to call in Process Builder. Now you just need to update the Opportunity ID you already have with the Contact ID you just got. Make sure your Flow has its start element and the pieces are connected. Save and Activate. The tricky part of the Process is that you can’t fire it from the Contact Role record being created. Process Builder can’t touch Contact Role at all. 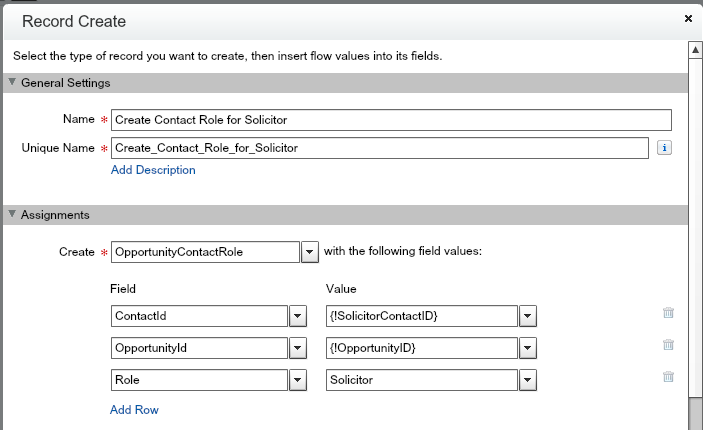 So instead, your Process Builder criteria needs to be on whether or not the Primary Contact role has a value or not. 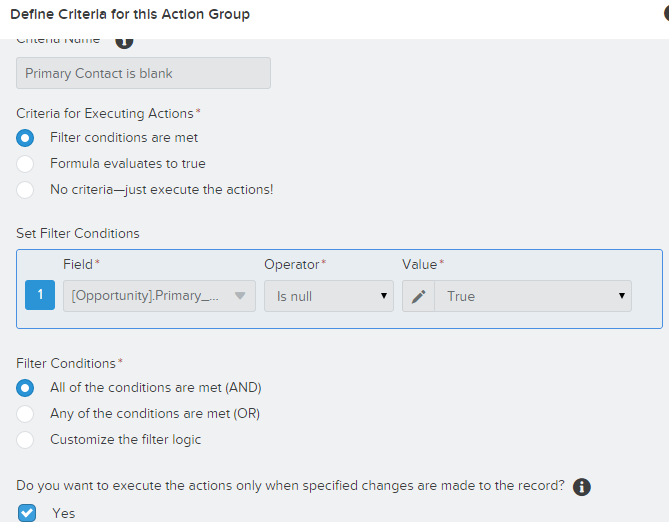 If it’s blank, then Process Builder will fire the Flow that goes looking for the Primary Contact. This is similar to the formula I used above in the other example, except it’s using the drop down conditions. As I said, go with what works. Previous Post Will Judi ever update her blog again? Hello Judi- Thank you so much for this great post. Do you know if it’s possible to create a process that does just the opposite of the above? 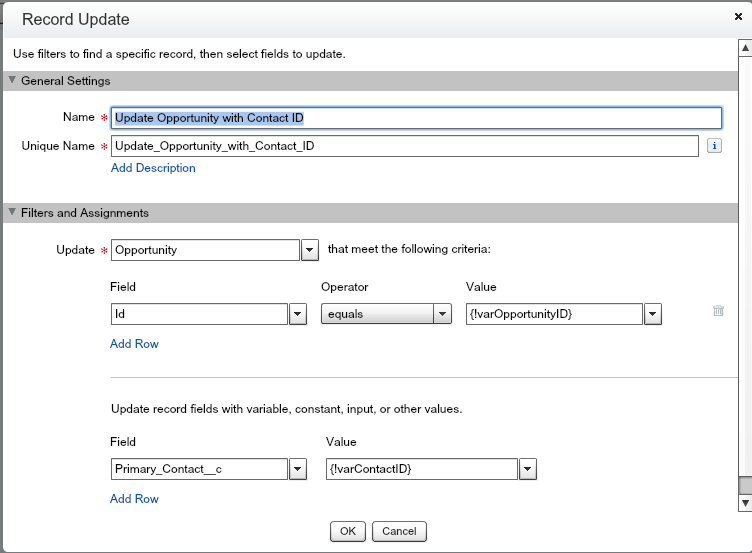 I need to auto-populate a look-up field on Opportunities with Primary Contact Role. Hello again Judi- Please disregard the above question!